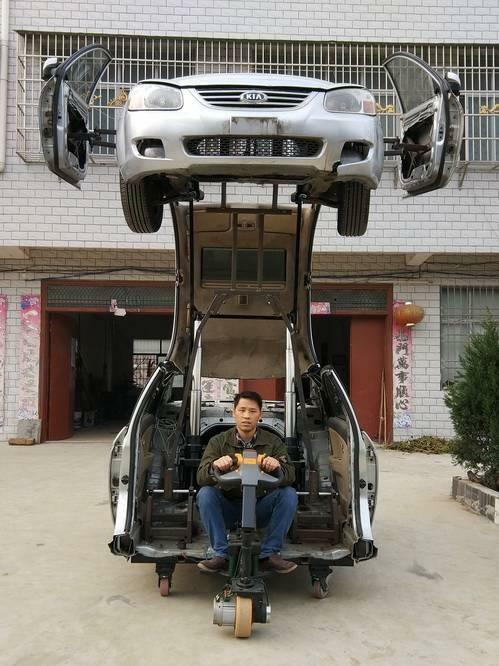 A Chinese man surnamed Wang, 35, from Xiangyang, Central China's Hubei province, has cut his old Kia car in half and transformed it into a life-sized Transformer. The vehicle-morphing robot is able to "walk" vertically when Wang manipulates the steering wheel in the driver's seat. Compared with other realistic statues of Transformers, the piece of work is on a whole other level. Wang's longtime enthusiasm for Transformers inspired his plan to make himself an actual car-morphing robot. He owned few toys in his childhood because of his family's bad financial situation, so the happiest thing at the time was to watch the cartoonTransformerson TV. From then on, he dreamed of creating his own Transformer. Wang left home to work in Guangzhou after he finished junior high school. Fortunately, he found employment at a toy factory, where he was surrounded by a lot of Transformers toys. After years of working, Wang earned some money and lived a stable life in Guangzhou, but he did not forget his dream. Over the years, he learned the production process for the toy and even the 3D industrial design software. This past July, Wang went back home and started to study how to make a real Transformer from a car. Almost half a year later, Wang turned his dream into reality. The project cost him 40,000 yuan ($5,847), but he said that he would spend his savings of around 1 million yuan to buy a better car and make another Transformer from it.